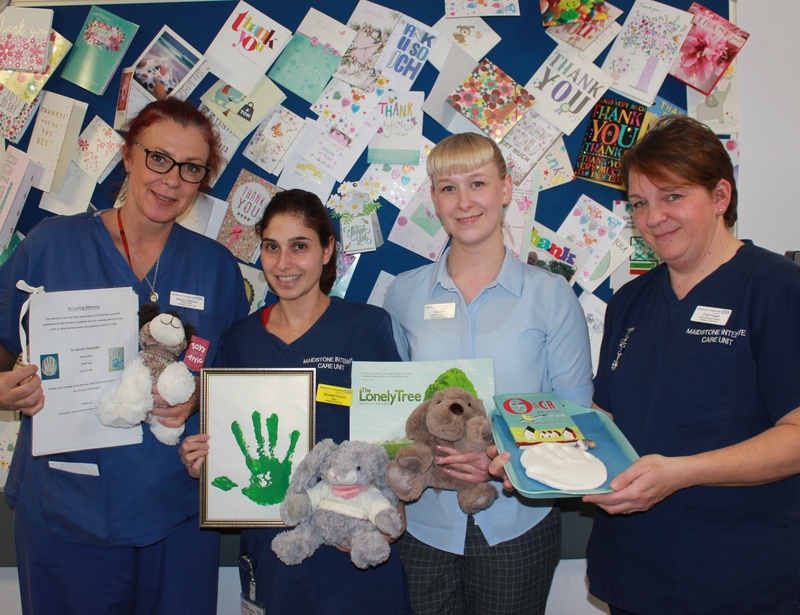 In Maidstone and Tunbridge Wells NHS Trust’s (MTW) recent CQC report, inspectors highlighted the Critical Care Unit’s introduction of a memory keepsake service as an area of outstanding practice at Maidstone Hospital. The service was set up in August 2017 by ITU Senior Sister, Maria Crittenden, so that relatives of patients who had passed away on the unit could choose a hand print, hand cast, fingerprint or lock of hair, to take home in memory of their loved one. After extensive research and many conversations with other NHS and healthcare partners, including Demelza House, the Heart of Kent Hospice and other acute Trusts, Maria set about raising money for equipment that could be used easily and appropriately to provide keepsakes for families who had suffered a loss. A quiz held at the Duke of Edinburgh pub in Barming raised £1,400 for the initiative and additional were raised through a raffle. A number of staff on the unit are trained to use the keepsake equipment, one of whom is always on duty. Maria and her colleagues are now researching other keepsake possibilities they hope to be able to offer in the future. The stone fingerprint keepsakes won top prize at the Maidstone and Tunbridge Wells NHS Trust Innovations Day in September 2017. NHS Innovations are now looking to develop the idea and offer it as best practice to other ITU departments in Trusts across the country.